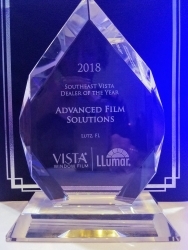 Advanced Film Solutions was awarded the Eastman LLumar SelectPro Dealer of the Year Award for the Southeast USA in ceremonies held last light at the Omni Resort, Amelia Island. Tampa, FL, February 25, 2019 --(PR.com)-- Eastman Performance Films, LLC, a leading manufacturer and marketer of high performance window film for residential and commercial applications, presented national and regional dealer awards at its annual Elite Dealer Conference, held February 23, 2019 on Amelia Island, FL. Advanced Film Solutions, Tampa, FL, was awarded LLumar SelectPro Dealer of the Year Award for the Southeast USA. Adam Feldman, Vice President and Mike Feldman, President, accepted the award. This is the second year that Advanced Film Solutions has earned this award having also earned this achievement in 2016. The Eastman LLumar SelectPro Window Film Dealer Network is the premier window film dealer channel in the USA. Advanced Film Solutions was recognized for increases in sales and meeting and exceeding the stringent LLumar SelectPro dealer standards. Advanced Film Solutions' President, Mike Feldman remarked, "This is an outstanding award and we are humbled to be selected on behalf of our entire team and proud to promote the Eastman LLumar SelectPro Window Film portfolio." Advanced Film Solutions is a family owned and operated window film business serving the greater Tampa Bay region. Founded in 2007 by Mr. Mike Feldman, the former National Sales Manager of 3M Window Film, Advanced Film Solutions has grown to be one of the largest residential and commercial window film installation companies in the USA.